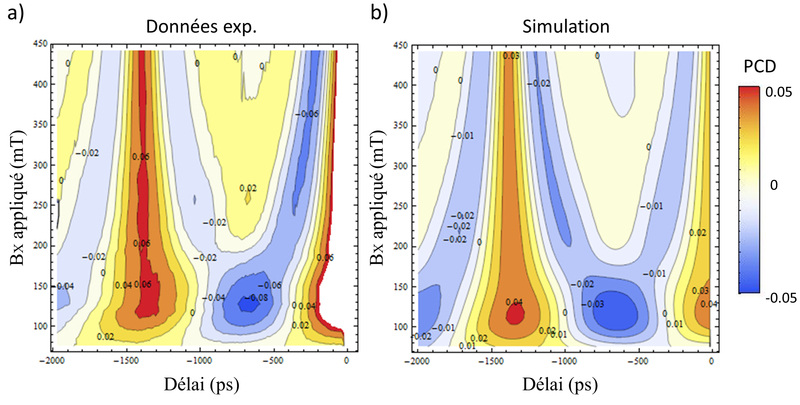 This work is a study of the dynamics and coherence of the spin in neutral and p-doped InAs/GaAs quantum dots (QDs) ensembles. The study is done thanks to pump-probe experiments, resonant with the fundamental transition. Firstly, the periodicity of the exciting laser is transferred to the precession of the hole spins in a transverse magnetic field, in the Modelocking frame. This techniques allows to overcome the strong inhomogeneities of the sample studied (105 QDs), and to observe a resynchronization of the spins at long delays. We can therefore estimate the coherence time of the hole spin to be 800 ns. Furthermore, similar experimental conditions allow us to observe dynamical nuclear polarization (DNP), and its important influence on the electron spin precession in a transverse field. The geometry of the DNP is characterized, and its long dynamic (500 ms) is measured. In a second part, the development of a heterodyne detection allows to improve greatly the sensitivity of the pump-probe setup, and hence to study small ensembles (300) of neutral QDs embedded in a cavity. We have characterized the fine structure of the electron-hole pair states in a longitudinal magnetic field, and demonstrated the manipulation of the phase of the quantum beats between these states by the magnetic field, when the excitation is done according to an axis that is not a symmetry axis of the system.